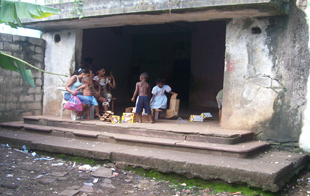 In 2007, CDS was invited to bring a medical brigade to the impoverished community of Pedro Brand, located on the outskirts of Santo Domingo. What awaited us there, was unimaginable. Over 500 families were squatting in the dark, damp ruins of an old Tuberculosis asylum that had be closed in the 60’s after the epidemic was under control. Living in conditions of no electricity, inadequate water supply and lack of appropriate sewage treatment, the needs were overwhelming. After assessing the nutritional status and living conditions of the children, we decided that regular visits to the community were necessary. Dengue fever, malnutrition and respiratory infection are the greatest health threats to the community. For the adults, severe unemployment, high illiteracy rates and poor technical skills made it apparent that more needed to be done. Severe poverty remains high due to the continued lack of employment. CDS has begun partnership with local community leaders and built a church in the area. The community has responded positively to medical and evangelistic outreaches. Future collaboration with the local leadership is being explored, as we desire to see the community advance through development initiations. In order to address the health risks, community education and nutrition programs are being developed. The first steps to securing a safe location outside the walls, and logistics using community residents as workers is being explored. The vision is to have a defined program working and in place by the end of 2013. Until that time, we will continue to do mobile clinics, provide nutrition and address the living conditions on a need basis.